THE WACKY WORLD OF WENDY WHITE! A WHOPPER OF A TALE! THE WACKY WORLD OF WENDY WHITE! 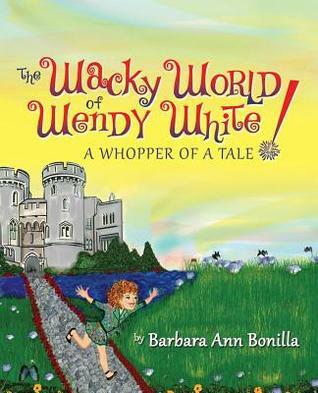 A WHOPPER OF A TALE by Barbara Ann Bonilla is a delicious Juvenile Fiction/Family/Alternative Family. With Food references, rhyming prose, and fairy tales, what’s not of enjoy! A food adventure you definitely want to read with your young reader. Who thought food could create just a delicious tale! With vivid pictures and easy to follow reading for not only young readers but for their grand parents, and parents. With witty dialogue, fun adventures, and tasty foods, you young reader is sure to enjoy this “Whopper of a Tale”. I would recommend to educators as well as parents, and grandparents. Well written to hold not only Young readers’ interest but adults as well. A delicious read! Visit the author’s website for recipes and updates. Source: Receive for an honest review from the publisher. THE FAIREST BEAUTY by Melanie Dickerson is an interesting inspirational Young Adult Romance/Teen Fiction. “Snow White and the Seven Dwarfs” retelling and brilliantly done,if I must say so myself and I do. What an intriguing story of Sophie and Gabe. Follow them as they journey to the Seven Dials,escape Sophie’s evil step-mother,oh wait,Sophie doesn’t know the evil Queen is her step-mother,and find love along the way. A brilliant retelling of “Snow White and the Seven Dwarfs”. Go on a journey to the Seven Dials,Hagenheim Castle,where an evil Queen resides,”Mirror,Mirror, on the wall,whose the fairest of them all” and Hohendorf Castle. Any teen is sure to love this story. With two betrothals,danger,deceit,faith,an evil Queen,a lost child,a father who thought his beloved daughter was dead and love. Well written with a great cast of characters,an engaging plot and oh did I mention an evil Queen. A delight to read with a few surprises,and lots of twists and turns. Received for an honest review from the publisher. Source: Received for an honest review from the author and publisher. Fairy Tale or True Life? Scented Adventures of The Bouquet Sisters in Fairyland is an interesting combination of both! Your Children will be delighted to share the mystical adventure of the Bouquet Sisters, as they fly around the World on their very own magic flying carpet. They are instructed by a beautiful team of Fairies called The Pretty Fiery Lights, who take them to learn from the Good Doctor (Gary Young) at his farm in Utah. The children learn about the Essential Oils and are sent on 7 Missions to anoint the Children of the World and pray for the Miracles needed to heal our World. This book will teach children the importance of prayer in changing things for good and to take care of their own health. The exquisite artwork of Josephine Wall and the Aroma Scent Release feature will engage their senses in beauty and the sweet scent of Sacred Oils. 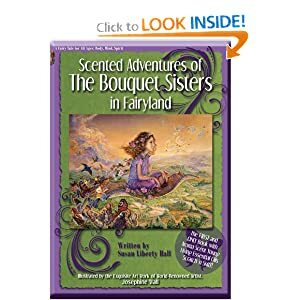 SCENTED ADVENTURES OF THE BOUQUET SISTERS IN FAIRYLAND by Susan Liberty Hall is an interesting children’s/young adult fiction. Written with details,myths,mystical adventure,and fairy tales.Three sisters fly around the world on a mission to teach the world of prayer,health,miracles,and the value of “Essential Oils”. This book teaches us each a lesson in kindness,and understanding of others values. With beautiful artwork and scratch n sniff scents throughout. What a wonderful idea for children of all ages,young and old! An interesting and intriguing title that stimulates the imagination of young and old minds. A great encouragement! Received for an honest review from the author and publisher. Visit Inkwell Productions and My Book Addiction and More for more information.